Today I thought I would share some sunshine with you! We were awakened with heavy rain early this morning and it was nice to see the sun and hear the birds later, and it made me think of this card that I made earlier this week! 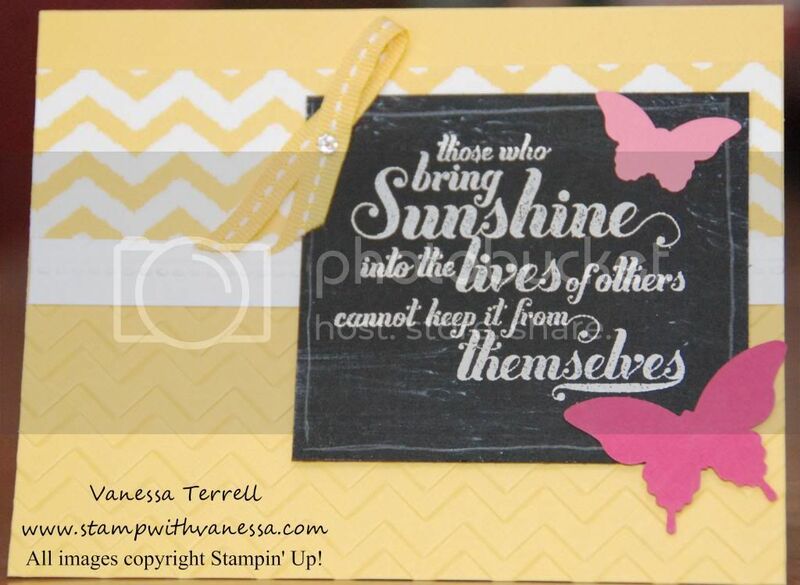 The card uses the Feel Good stamp set and Parker's Patterns DSP both from the Spring Catalog and it also uses a called Chalkboard. Fun technique, I will have to try this again with some other stamp sets. Very easy to do. Doesn't this make you think of Spring? I don't now how I followed you again today but I am once again amazed at everything you can do with stamping. I love this card I live in NY and we are surrounded by snow and cold. Anxiously awaiting spring spring so anything that reminds us of spring is wonderful! Thanks for sharing! Thanks Gladys, I hope it thaws out soon for you and it's not like that where I am, but I am looking forward to spring! Thanks Catherine! Yes I love this technique and I'm looking forward to playing with it again. Appreciate you stopping by! Lovely message about allowing sunshine in - I like it!